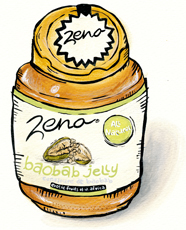 Baobab Jelly for sale. Buy online at Zingerman's Mail Order. Gourmet Gifts. Food Gifts. There's no tree more iconic to Africa than the Baobab. They call it the "upside down tree" because it's leafless for much of the year and looks like roots stretching into the air instead of branches. It might be more apropros to call it "the giving tree" since it provides food, clothing, medicine, shelter and water to animals and humans across the African savannah. Its fruit is reminiscent of coconut. They're big (they weigh a few pounds each) and have a hard, smooth shell protecting white flesh inside that tastes bright with hints of vanilla. To make this unique jam, the fruit is sun dried to concentrate its sweetness, then macerated and mixed with a bit of water, sugar and just a touch of pectin to hold it all together. The result is an incredibly unique jam with a near custard texture. It's tart with vanilla undertones and tastes like no other jam or jelly I've tried in nearly twenty years of food finding. That's saying something.